March 11, 2011, 10 a.m.
By Mark Coddington @markcoddington March 11, 2011, 10 a.m. Reaction was mixed: The right, of course, was outraged, though others like Slate’s Jack Shafer and Gawker’s John Cook downplayed the significance of the video. NPR was outraged, too — “appalled,” actually, with 21 journalists condemning the remarks. CEO Vivian Schiller said she was upset and that the two execs had put on administrative leave, but within about 12 hours, however, Schiller herself had been forced out by NPR’s board. The New York Times has good background on the shocking turn of events, and Poynter summarized the six months of controversy that led up to this, stretching back to Juan Williams’ firing (the American Journalism Review’s Rem Rieder called Schiller’s ouster “Williams’ revenge”). Reaction to NPR’s handling of the situation was decidedly less mixed — and a lot more scathing. In a chat and column, NPR ombudsman Alicia Shepard ripped just about all parties involved, and the online response from media-watchers was just as harsh. NYU j-prof Jay Rosen called it “profoundly unjust,” and several others blasted NPR’s leadership. The episode also stoked the fires of the perpetual debate over whether public radio should keep its federal funding. The Atlantic’s Chris Good looked at the political aspects of the issue, and The Christian Science Monitor examined whether public radio stations would survive without federal money. A few calls to defund public radio came from outside the traditional (i.e. conservative) places, with Gawker’s Hamilton Nolan and media analyst Alan Mutter arguing that NPR will be in an untenable situation as a political football as long as they’re getting federal funds. Meanwhile, here at the Lab, USC’s Nikki Usher did give some encouraging information from the whole situation, looking at Schiller’s legacy of digital and local innovation during her NPR tenure. Making hyperlocal news personal: AOL continued its move into local news late last week, as it bought the hyperlocal news aggregator Outside.in. In an excellent analysis at the Lab, Ken Doctor argued that the purchase is a way for AOL to get bigger quickly, particularly by bulking up Patch’s pageviews through cheap local aggregation tools. ReadWriteWeb’s Marshall Kirkpatrick took the opportunity to ask why hyperlocal news technology services like Outside.in, Everyblock, and Fwix haven’t been as useful as we had hoped. Mathew Ingram of GigaOM posited an answer: Hyperlocal journalism only works if it’s deeply connected with the community it serves, and those technologies aren’t. Without that level of community, “AOL is pouring money into a bottomless pit,” he wrote. The Knight Digital Media Center’s Amy Gahran said that might be where local news organizations can step in, focusing less on creating news articles and more on using their community trust to make local information useful, relevant and findable. Elsewhere on the cheap-content front: All Things Digital reported that AOL is laying off hundreds of employees (including the widely expected gutting of several of its news sites), and Business Insider snagged the memo. Wired talked to two Google engineers about its anti-content farm changes, and Wikipedia founder Jimmy Wales said good content is created either by passionate fans or by proper journalists being paid a fair amount. But, he said, “paying people a very low amount of money to write about stuff they don’t care about — that doesn’t work.” And Dan Conover at Xark warned against turning content — especially hyperlocal — into a franchise formula. Accountability and authenticity in online comments: TechCrunch was one of the first companies to try out Facebook’s new commenting system, and after about a week, MG Siegler noted that the number of the site’s comments had decreased, and they’d also gone from nasty to warm and fuzzy. Entrepreneur Steve Cheney proposed a reason why the comments were so “sterile and neutered”: Facebook kills online authenticity, because everyone is self-censoring their statements to make sure their grandmas, ex-girlfriends, and entire social network won’t be offended. Meanwhile, Joy Mayer of the Reynolds Journalism Institute got some advice on cultivating online reader engagement from the Wall Street Journal’s (and formerly the Lab’s) Zach Seward, and the Lab’s Megan Garber reported on the results of some research into which stories are the most liked and shared on Facebook. More paywall test cases: Newspapers continue to pound the paywall drumbeat, with the CEO of newspaper chain Gannett saying the company is experimenting with various pay models in anticipation of a potential one-time company-wide rollout and the Dallas Morning News rolling out its own paywall this week. Ken Doctor crunched the numbers to try to gauge the initiative’s chances, and media consultant Mike Orren disagreed with the News’ idea of how much a metro newspaper’s operation should cost. Elsewhere, Reuters’ Felix Salmon made the case that Britain’s Financial Times’ paywall strategy has contributed to its decline, writing, “the FT strategy is exactly the strategy I would choose if I was faced with an industry in terminal decline, and wanted to extract as much money as possible from it before it died.” Meanwhile, The New York Times’ public editor, Arthur Brisbane, chided the Times for not aggressively covering news of its own paywall, and Mathew Ingram of GigaOM called paywalls a futile attempt to hold back the tide of free online content. — New York Times executive editor Bill Keller wrote a rather odd little column taking shots at news and opinion aggregators, especially Arianna Huffington. Everyone then took shots at his column, including Huffington, TechDirt’s Mike Masnick, GigaOM’s Mathew Ingram, and Gawker’s Hamilton Nolan. — Newsweek published its first redesigned issue under The Daily Beast’s Tina Brown this week. The Society of Publication Designers had a look at the issue, which Slate’s Jack Shafer panned. 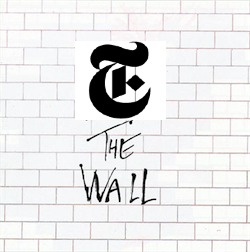 The New York Times noted the issue’s familiar bylines. — A few Apple-related notes: At MediaShift, Susan Currie Sivek looked at the impact of Apple’s 30-percent app subscription cut on small magazines, and Poynter’s Damon Kiesow urged Apple-fighting publishers to move to the open web, not Android-powered tablets. GigaOM’s Om Malik joined the chorus of people calling for iPad apps to be reimagined. — Two great posts at the Lab on search engine optimization: Richard J. Tofel on why the web will be better off with the decline of SEO, and Martin Langeveld on the SEO consequences of including paid links on sites. — Former Guardian digital chief Emily Bell gave a fantastic interview to CBC Radio about various future-of-news issues, and Mathew Ingram summarized a talk she gave on newspapers and the web. POSTED March 11, 2011, 10 a.m.
Coddington, Mark. "This Week in Review: NPR at a crossroads, hyperlocal’s personal issue, and keeping comments real." Nieman Journalism Lab. Nieman Foundation for Journalism at Harvard, 11 Mar. 2011. Web. 23 Apr. 2019. Coddington, Mark. "This Week in Review: NPR at a crossroads, hyperlocal’s personal issue, and keeping comments real." Nieman Journalism Lab. Last modified March 11, 2011. Accessed April 23, 2019. https://www.niemanlab.org/2011/03/this-week-in-review-npr-at-a-crossroads-hyperlocals-personal-issue-and-keeping-comments-real/.